Avengers #12 Review – AiPT! A good issue that digs deep into Marvel history to pluck out one of the wildest superhero teams in some time. Team building is a big part of superhero comics. Everyone has their picks for the Justice League and Avengers if they were to have the pick of the litter. A dream team so to speak. Jason Aaron is doing that and more, having already introduced a new Avengers, a Russian superteam, and an American superteam. In this latest issue, he gets to form another new team and it should make longtime Marvel Comics fans very happy. Aaron is clearly building towards a new status quo when it comes to superhero teams on the planet. The Avengers have typically been the only one, but it’s fun to see this idea of teams fleshed out globally by country. Black Panther’s hand in this “arms race” adds another layer since the Avengers are so big they need a sub-team! This issue has an Ocean’s 11, getting the band together vibe that’s quite fun. It focuses on Black Panther hopping around the world asking superheroes to join him in a new initiative that’s not the Avengers. Familiar characters like Jarvis and Wasp pop up, but also obscure Marvel heroes like Gorilla-Man are visited. As the story builds towards the end of the issue we get tidbits on what this team’s purpose is and what it’s called. There are two names bandied about, both of which are pretty cool, but it’s safe to say Black Panther is taking his role as Avengers Chairman seriously. Aaron is asking the question, “Without S.H.I.E.L.D what should the best heroes do?” This issue answers that. This issue also begins to build toward the vampire plot hinted at when Blade popped up in a previous issue. 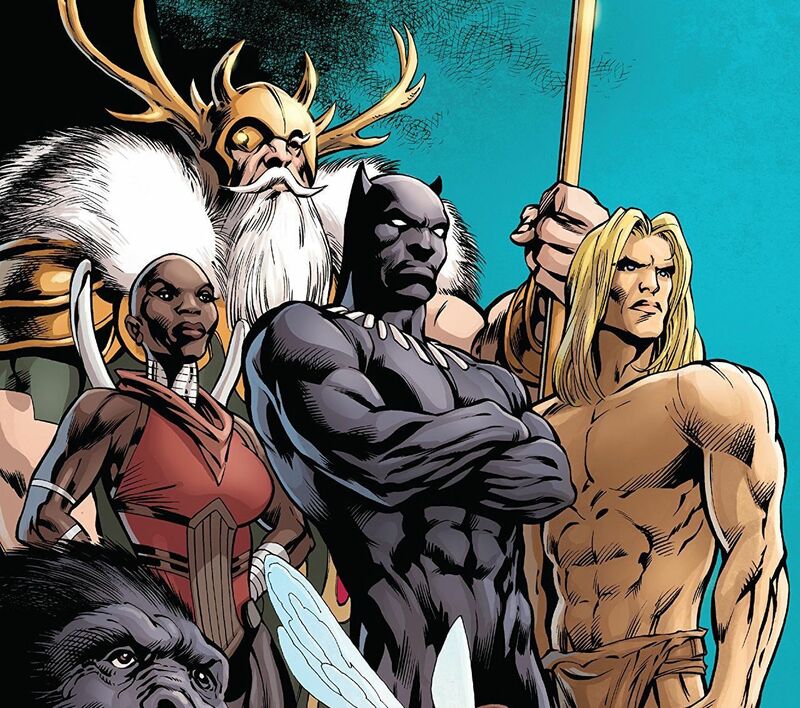 It’s quite clear this team is a big part of how Black Panther is planning to stop a vampire uprising and there are some rather cool–and very obscure–characters utilized. This issue is a reminder of how the Marvel gallery of heroes is rich and deep. The art is shared by Ed McGuinness and Cory Smith (who it appears finishes the last few pages) and is generally good. There is a lot of talking and it’s hardly noticeable for the most part. Serving as a blockbuster style story there are big splashy pages to show off some character reveals that’ll get the fans pumped. Jarvis put on a bunch of weight since Amazing Spider-Man. There’s an interchange or two that is rather heavy-handed with its dialogue. It becomes more of a chore to get through the stakes and expectations of Black Panther and his mission near the end. “Show, don’t tell” is an adage to live by, but much of this issue is telling. Truth be told it’s mostly meetups and promises being made making the entire experience exposition and not much more. A good issue that digs deep into Marvel history to pluck out one fo the wildest superhero teams in some time. Obscure is an understatement, but it’s exciting to see a new kind of super team coming together. A good issue that digs deep into Marvel history to pluck out one of the wildest superhero teams in some time. Obscure is an understatement, but it’s exciting to see a new kind of super team coming together.